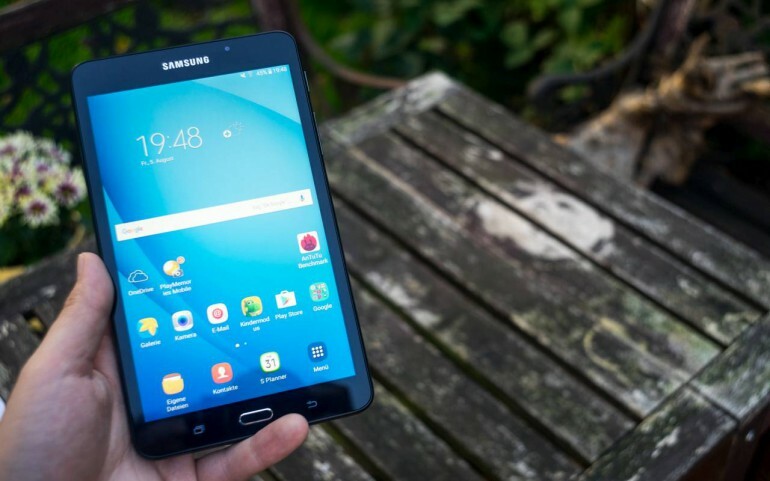 Samsung might be releasing a new tablet from its Galaxy Tab A lineup soon. As famous leaker Roland Quandt found out a new tablet with the product number Samsung SM-T385 appeared in the database of GFXBench. It’s very likely that it’ll be called Samsung Galaxy Tab A 8.0 (2017). Thanks to the database entry we know all of the specifications already. It’s very likely that Samsung will release an updated version of the Galaxy Tab A 10.1 as well. But will they release a new Galaxy Tab A 7.0 with an 8 inch version on the way? I have no idea. While the 7 inch tablet was launched very silently in Europe and didn’t make it into any bestseller lists, it became very popular in some Asian countries like Thailand and India. According to the leak the Galaxy Tab A 8.0 will be a solid middle class tablet. It comes with an 8 inch display that has an hd resolution at 1280 x 800. Inside runs a Qualcomm Snapdragon 425 processor which is a chipset found in a lot of cheaper smartphones. It’s a quad core SoC with four cores clocked at up to 1.4GHz. The at GFXBench leaked SM-T385 is the LTE 4G version. Samsung might put a different chip into the WiFi only model. We’re also getting 2GB of memory and an internal storage with a capacity of 16GB. That’s a big step up from the Galaxy Tab A 7.0 which was launched with 8GB only. Other features include an 8 megapixel camera on the back as well as a front facing camera with a resolution of 5 megapixel. Both are capable of shooting video at 1080p. Next to optional 4G the tablet will support Bluetooth and GPS. The Galaxy Tab A 8.0 will be the first cheap tablet to run Android 7.0 Nougat. As usual it’s very likely that they’ll put their TouchWiz UI on top of it. That’s okay because I quite like what they did with their interface in the last couple of years. The Samsung Galaxy Tab A 8.0 2017 is a very solid tablet. Its highlights are a great battery life, recent software and an overall good performance. While the display is good overall, it offers an HD resolution only and is not laminated. A couple of direct competitors offer very similar hardware at a cheaper price.